Our latest photo report brings us to Disney Springs for a quick evening visit. Starbright Holidays (the drone show) was still happening while we were visiting, it has since come to an end for the season. It’s worth noting that the Characters in Flight balloon had not yet been taken down for its refurbishment where it is getting a new-look balloon. Work continues on the Planet Hollywood Observatory and Stargazers Bar (I thought it was lounge, but the sign says otherwise). Goodbye character-filled design. The new design will be devoid of any characters to better fit the theme and story of Disney Springs. Oh well. The Planet Hollywood entrance is still covered up. 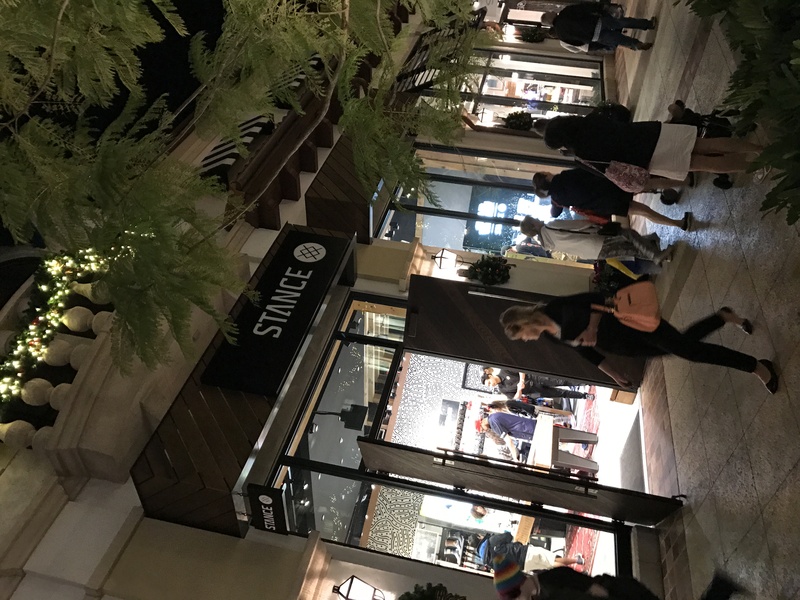 A new store called Stance recently opened, and they sell socks. I would usually say that a store like this won’t last, but they have licensed Disney and Star Wars socks. They are a little pricey at over $15.00 a pair, but they are pretty neat. Work continues on The Polite Pig, set to open this year. Over at D-Tech on Demand inside Marketplace Co-Op, a Star wars category was added to the phone case creation kiosks. Walt Disney World Marathon designs were available here. A new MARVEL comic books’ case. D23 members can pick up an exclusive phone case here as well. More of the stackable meal sets for sale inside of Once Upon a Toy. These new Mickey and Minnie model sheet art pieces were on sale at the Art of Disney, they cost $295.00 each. Work continues on The Paddlefish. The paddlewheel and smokestacks are back, which despite the new exterior, makes the boat look really fantastic. Thank you, love these reports. Can’t wait for Paddlefish!! Are they going to have another drone show or is it only at Christmas time. And most likely, only this Christmas. I think it was a proof of concept. The drones were sent back to Germany. Any news on The Edison regarding when it will opening? This makes me think Epcot should just close their doors. Such nicer atmosphere and restaurants, and everything up a notch cuz it’s not just Disney being cheap and calling the shots. Few companies in the Springs you can tell are really trying to make it a good experience! Pete, Pete, Pete. Please go away. Disney Springs is awful. You’re better off going to the Mall at Millenia. Do we have an opening date for Paddlefish yet?